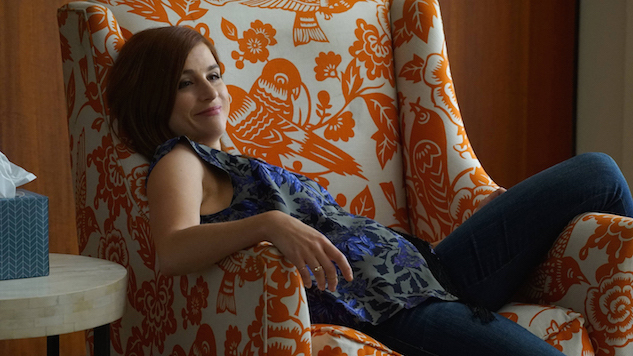 To catch up on past coverage of You’re the Worst click here. There were moments of this weeks episode of You’re the Worst that felt as if the series was wading through a bit of a stalling period as characters continued to deal with the same problems that have plaguing them now for weeks. Only Jimmy’s continued exploration of his life without the weight of his father feels at all substantial, and even so it seems like an awkward addition after the story so beautifully and tragically wrapped up last week. Lindsay’s storyline meanwhile does little to justify her actions or engage viewers any more than they already have, especially with the show continuing to find new ways to showcase Paul in demeaning situations. Meanwhile Edgar finds himself in trouble with the weed advocates who use his PTSD as a means of justifying their own political cause. All of this is brought to the forefront by Gretchen who adopts a maternal model for a few days or, more accurately, her own mothers method of maternal instincts which means a lot of manipulation, extremely tough love and punishment for imperfection. By the end of the episode at the very least we have a greater idea of who Gretchen is and why and her mother, full of passive judgement and bossiness seems to have breed some sort of discontent in her daughter. Nothing sums her adoption of the character up better than when she causally asks Edgar if the shirt he’s wearing is the one he plans to wear later in the day at a meeting, before walking away and leaving him to stumble in his newfound insecurity. This is who Gretchen grew up with, the woman who would take her pillows and sheets away if she performed poorly at a tennis match. Is there really any question as to why she’s so prickly as an adult? The fact that she uses this exercise as some sort of motive against her long suffering therapist only further explains her eccentricities. Of course she would need to feel like she’s won something in order to open up about something vulnerable. Jimmy’s excursion-again due to Gretchen’s meddling-takes a lighter tone than the rest of the episode as he, in the midst of a form of writers block, goes and explores the outdoors in a way he never has before, learning the he enjoys dogs, hipster picnics and community basketball. After spraining his ankle playing he even realizes, while with Vernon, that he feels ready to explore the podcast world. Vernon and his podcast and the specific jokes about the community might have been the biggest laugh of the night, especially when they pause for an inane commercial break for red napkins. However the biggest takeaway from this social experiment of Jimmy’s is that maybe he doesn’t actually want to be a writer. Maybe he only ever was a writer as a reaction to his father who was vehemently against it. Now with his fathers passing he has a moment to reflect and think about what it is he really wants to do with his career and his life and, as Jimmy puts it, what really is his true authentic self. Jimmy with a mission is a force to be reckoned with so we’ll have to wait and see what this newfound freedom directs him towards thought I have a feeling in the end it will still be writing. Lindsay and Edgar continue to suffer in their subplots, particularly the former who continues to engage in such heinous decision making that she’s becoming increasingly difficult to watch. Kether Donohue is such a tremendous delight as Lindsay but at this point the character should just leave Paul, who really is quite a drag, rather than torment him by pretending it’s for their benefit. Edgar has a whole lot of endless goodwill due to his stand alone episode earlier this season which was simply stunning but even his progression with weed is beginning to tire. Where on earth is Dorothy? Why aren’t we exploring how smoking has helped him in other elements of his life? We’re told this week that he’s beginning to feel like a human again and rather being told this it would be nicer if we could actually spend some moments with him to see it firsthand. Regardless it ends on a perfect note with Gretchen confronting her therapist at a resturant to admit that no, her mother probably wasn’t the best. It’s a big enough step for the character to call it a triumph but not so world shattering as to suggest there isn’t plenty more worth diving into. Until next week. Previous ArticleTV Review: Supergirl 2x02 "The Last Children of Krypton"
Next ArticleMovie Review - Kevin Hart: What Now?